Do you find that people visit your profile and do not connect with you? Or many people who did not accept your request? Or inspite of trying hard, you are not getting any job offers. The reason to this is simple- you have too many mistakes on your LinkedIn profile. Anyone can make a LinkedIn account but using it well, to an optimum level is nothing but an art, and requires lots of work. Recruiters find people from LinkedIn for the open positions, even if they find the resume from another source, they would surely be checking your LinkedIn, Facebook and twitter account. Unless there is profane content on Facebook and twitter, recruiters won’t bother much. 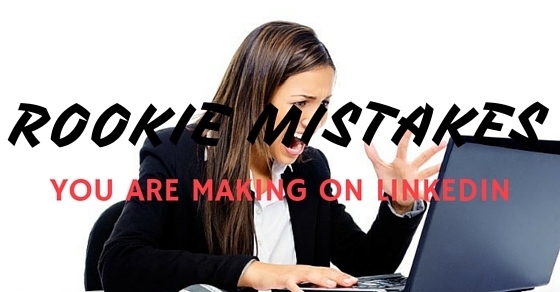 However, even the little mistake on your LinkedIn account can make or break the situation. It acts as a decision factor, LinkedIn being a professional networking site, how you present yourself to the corporate world says a lot about you. If one wishes to have several good connections, good credibility and value to your LinkedIn Profile, then following some LinkedIn tips would be very beneficial. Avoid all rookie mistakes, this mistakes may sound very innocent and less harmful but actually, it does have a lot of impacts. Let us look at those rookie mistakes we all have been doing, let’s see how many you have committed. Many people prefer not to post their profile picture though they have rest of the profile totally updated, majorly people do not want to reveal their identity or fear discrimination, but having a professional LinkedIn photo is a must and here’s why. Often there are spammers on every social networking sites and it follows to LinkedIn too. The first thing people notice on LinkedIn is your name and your profile pic. If there is no pic, people may assume that it is a fake profile, or probably the profile is incomplete. Profile pictures maintain consistency, and thus, people from other social networking connect to you on LinkedIn as well. A profile picture acts as your personal logo and represents you as a brand. Having an unprofessional photo does more harm than not having a profile picture altogether. It shows that the person is unprofessional and gives altogether a bad impact. A good photo in formal attire is the best choice. Party pic, marriage pic, group pic, selfies should be limited to Facebook only. iii. Pose should be decent, professional looking. A smiling face suits the best. v. Avoid unnecessary distractions and things in the background. After having a look at your photo and name, the next thing one sees is your LinkedIn headline. LinkedIn has a setting of displaying the designation and current company by default, but LinkedIn headline acts as a deciding factor for the recruiters and other professionals, to click and view the profile. Thus, it is very crucial to have a good LinkedIn headline. One may question, what is wrong with the designation and current workplace to be displayed as a headline. But this information is something which one will receive when he looks at your summary and rest of the profile. LinkedIn provides you 120 spaces to be creative, witty and describe yourself the best. One should consider it as your tagline for selling or advertising yourself. ii. Be specific and precise but not boring. Jazz up the headline with your specialty but do not just list out all the things you know, just weave it into a suitable sentence. v. Do not be desperate at any cost, do not put headline as ‘looking for change’, Unemployed, instead write the job you desire to have. Looking post your photo, name and headline, next comes your summary. Rookie mistake one does on LinkedIn is to skip writing anything in summary or writing something boring. A summary for LinkedIn plays a very important part. Summary should give clear and precise information about you and your experience. It is advised to weave in sentences concerning the person you are, your education, how you moved from one job to other, the things you learnt, your specialization and how you can be helpful to others. When you make your resume do you leave aside any information? You deligently put your education, job history, work profile, achievements and so on. The same principal works on LinkedIn too; hiding some information affects your credibility. Having a complete profile helps your employer to easily locate you. Avoid writing vague information in your profile, make suitable changes and weave in important keywords in your profile. It will help in increasing your visibility in the search result. LinkedIn will find your profile on top of the search list if you use keywords several times, but imagine how shabby the profile will look, if you repeat the keywords several times. It is not advised to stuff your profile full of keywords. One may sound too desperate and hence may not benefit you in any ways. People will find your profile but may not wish to connect to you. And probably you will end up doing another rookie mistake, i.e. saying ‘I see you visited my profile’ to people. Typos in your headline will rule out the probability of being contacted completely. Other than headline, one should also take care that they pay attention to the spelling and punctuation mistakes. Errors give an impression that the person is careless. If a person does not pay attention while filling out his own details then what diligence can one expect in work. Hence it is advised to proofread everything before posting. One needs to be precise and clear in the information you state about yourself. Avoid words like’ experienced’, ‘hard worker’, ‘detail oriented’, instead describe your experience with some powerful adjectives like astute, enthusiastic, energetic, passionate etc. Though a complete profile is appreciated, but rambling your whole life story will turn off the readers, no one has time to read and process large chunk of data. When you send a personal note in the LinkedIn request it shows that you care and really wish to connect to that person. Simple one line introduction and the purpose of connection does the job well. A default line for connecting with people is totally a bad idea. By joining relevant groups, one can demonstrate his skills and expertise by sharing his views. This way you can also make yourself visible to your potential employers and also get a chance to connect to people with similar expertise. The sole purpose of LinkedIn is to connect to all professionals and just because one can see who viewed your profile, it doesn’t mean one can ask ‘I see you visited my profile’ it is mere creepy and awkward conversation to have. Instead one should take a call that one’s profile is lacking something which makes people go away without connecting to you. Recheck your profile and inspect for the necessary changes that can be done. We are living in a connected world, people talk to each other and it is very easy to find out how genuine the person is. Lie can easily be caught and one can get in a great trouble because of it. Avoid lying, do not write the projects you haven’t done, or achievements and certification you have not received. It takes many years to build your reputation, but it can get tarnished in a minute. So lying is totally off limits on LinkedIn. People often make this mistake and end up in a trouble. Having no conversation with your connections, not posting anything and not connecting to people simply makes you non existent. People want to be connected with people who have several connections. When you have more than 500+ connections, LinkedIn will just display 500+ connections, thus it is advised at least to have 501 connections. Also speak to your connections at least once in a while, congratulate them on their new job, wish them on their birthday, and comment on their posts. These are the simple activities which keep you connected with the crowd. Networking is not just the number of connections one has, but it’s about how many valuable connections you have. Unless your URL is customized, the default URL is unusually long and weird. Recruiters may need to share your LinkedIn profile or people do mention their LinkedIn Id on resumes. So will you share and write your unusually long default URL? Off course no. One can go in settings and customize your URL. It is personalized and takes up a little space and looks good to be written on a resume. One must build a rapport with the group members and then start posting any links you want them to have a look at. It is a most common social mannerism to follow. If you want some recommendations, it is better to ask to people who know you well, like your bosses, colleagues and friends. They know you well and will give valuable insights about you to people. Asking recommendation to strangers is simply ridiculous. One cannot benefit from fake recommendations. In LinkedIn we may at times require to send mass messages. While we send mass messages through our email we make sure all email addresses are in Bcc. LinkedIn also prompts by saying ‘allow recipients to see each other names and email addresses. One must not forget to uncheck this box. You surely do not wish to let people know that you have mass mailed. Another rookie mistake people often make is not building rapport and directly pitching in sales. It simply puts people and feels super annoying. One is supposed to get to know each other, about their businesses and later subtly introduce them about the things you can offer. Most of the times, people will buy your services or product for the sake of good relations. Developing relations on LinkedIn requires some time as you do in real life. One needs patience and needs to gain trust. Though it is a good idea to post in groups, provided the discussion matches the group specializations and engages most of the members. But spamming in groups can make you lose connections and bring bad name. So avoid spamming and posting irrelevant content in groups, keep group moderators happy. We are so used to Facebook and twitter than very often people do a rookie mistake of sharing puzzles, funny cartoons, family photos on LinkedIn. One must not forget “what is LinkedIn used for”, “how important is LinkedIn” and so on. It is a professional networking site and people should stick to professional updates only. One must keep it business oriented and classy. Now that you know the mistakes to be avoided, make sure you remove all of them by reframing your profile and your actions. You will surely be thanking this article when you get several connections. Have you come across any other rookie mistakes that annoyed you? Feel free to share. Previous articleWhy are Recruitment Consultants So Annoying?